Good God check out this monster Rainbow. I could see if we were on Ontario tribs or off the Finger Lakes but to catch this pig in northern NY. This beauty was caught by NYS guide Rich Garfield he said that this was 22 inches and around 6-7 pounds of trashing red striped mayhem. 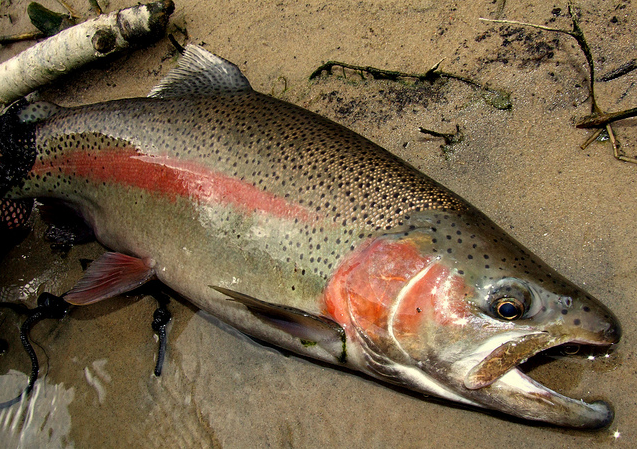 Caught in late April it demonstrates what great Rainbows we have in addition to the huge Browns. Early season tends to be tough fishing but great ones are often the result. They like to winter in this section after the spawn in the Fall. Wish I was there to get this one on film. native to inland New York the Lake Trout and the Brook Trout and both species are actually in the Char family. in old limestone quarry in Southwestern St. Lawrence County and stocked it with fingerling Rainbows (4-5″) and they look exactly like the Trout in the picture. The owner of the private hatchery in Chateaugay where we purchased the trout assured me that even native species such as Brook Trout that come from state hatcheries do not reproduce once stocked in Adirondack Ponds and actually pose a huge biological threat to any native species of trout because of the diseases they carry from being raised in such close quarters with other fish. were introduced to the area as a NYS stocking program and require highly oxygenated extremely clean running water in order to spawn. I was told that the proper conditions for Rainbow Trout to reproduce do not exist in New York State and if that state were to stop it’s stocking program it would just be a matter of time before it would be impossible to catch a Rainbow Trout in New York state, with the possible exception of a Lake Ontario Steelhead which is a member of the Rainbow Trout family.